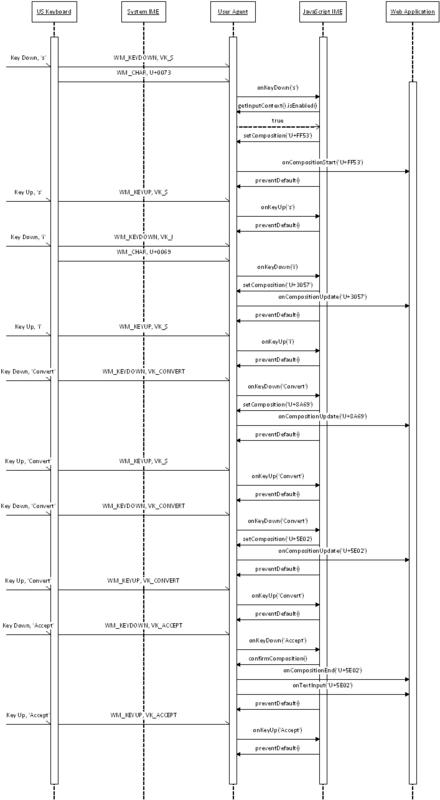 An InputMethodContext interface, which provides methods to retrieve detailed data from an in-progress IME composition, and to update that data. 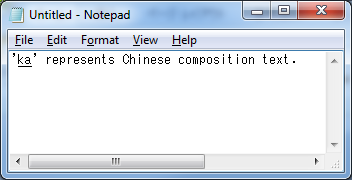 A Composition interface, which represents read-only attributes about the current composition, such as the actual text being input, its length, and its target clause. This API is designed to be used in conjunction with DOM events and elements on the Web platform, notably: composition events and the Canvas 2D Context API [ CANVAS-2D ]. This document was published by the Web Applications Working Group as a First Public Working Draft. This document is intended to become a W3C Recommendation. If you wish to make comments regarding this document, please send them to public-webapps@w3.org (subscribe, archives). All feedback is welcome. 2. Background: What’s an Input Method Editor? Even though existing Web-platform APIs allow developers to implement very complicated Web applications, such as visual chat applications, using technologies such as SVG or the <canvas> element and API, developers have difficulties when implementing Web applications that control input-method editors. 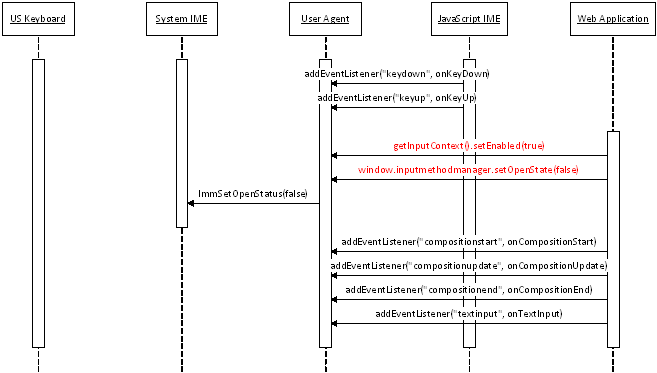 To provide the ability for hosting user agents to expose Web applications to the composition text being composed in an associated IME, the DOM Level 3 Events specification [ DOM-LEVEL-3-EVENTS ] introduces composition events. Using composition events, Web applications can retrieve composition text from an IME. To solve these IME-related problems, this specification introduces an IME API that allows Web applications to read and write composition data made available by user agents. Moreover, this specification introduces interfaces for compositions, so Web applications can read detailed composition data and update it. A Composition object provides a reference to an ongoing IME composition, so Web applications can retrieve the composition text and attributes. The use of those APIs allows Web applications the ability to set the position of a composition window and to retrieve the text and attributes of the ongoing composition. Consider the following examples. 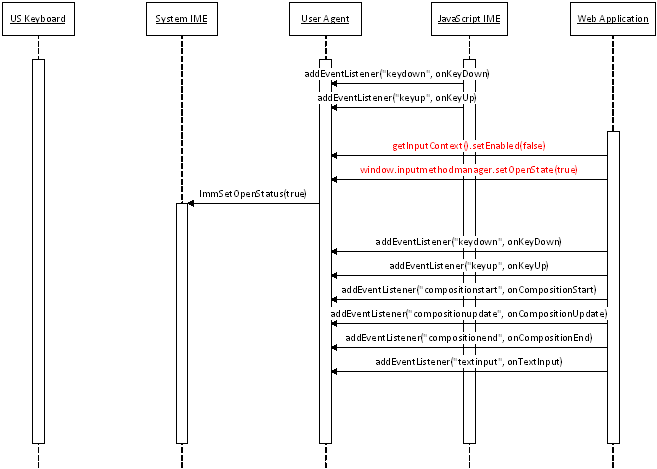 The first example shows the source for a Web application that renders composition text by itself and uses the candidate window provided by an IME. // Render the clauses in the composition. // Draw the text of this clause. // underline for non-selected ones. 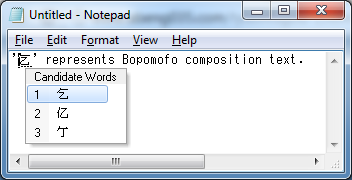 // Move the candidate window outside of the composition text. 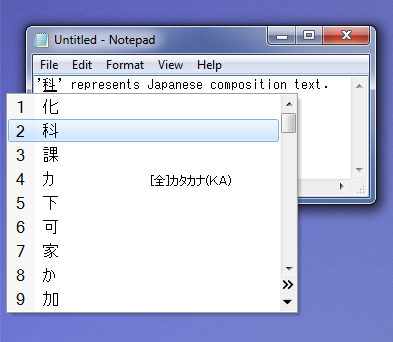 The next example shows the source for a simple IME that composes Japanese Hiragana characters from key strokes. This is just a sample and not suitable for real use. // Disable the system IME associated with this window. // Listens the keyboard events. // Toggle the input mode when pressing a shift key. // Exit if this IME is not activated. 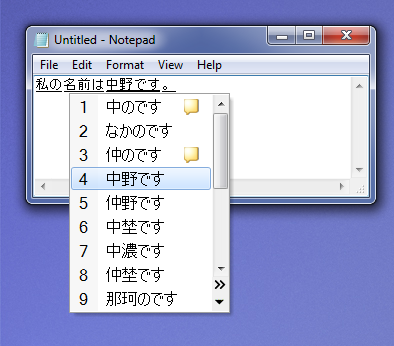 // Convert the input key strokes to a Japanese character. // Fill the Composition object. // Send the Composition object to the user agent. A composer is a context-free parser that composes non-ASCII characters (including phonetic characters) from keystrokes. A converter is a context-sensitive parser that looks up a dictionary to convert phonetic characters to a set of ideographic characters. A IME composition is a instance of text produced in an IME. 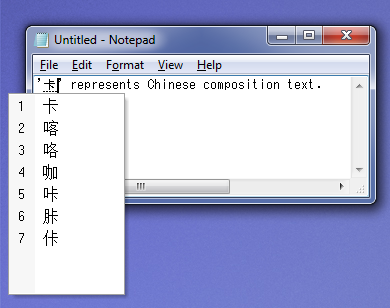 A phonetic composer for Simplified Chinese outputs the input ASCII characters as its composition text. On the other hand, a phonetic composer for Japanese outputs phonetic characters when the input ASCII characters have matching phonetic characters. 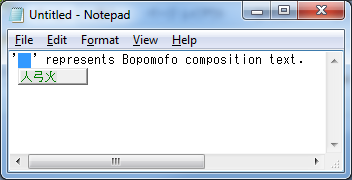 A phonetic composer for mathematical symbols outputs a composed mathematical symbol and shows the source keystrokes to its own window, which is an example of a composition window. Radical composers are mainly used for typing Traditional Chinese and Korean with phonetic keyboards. Each phonetic keyboard of these languages can produce phonetic radicals: e.g., typing ‘r’ produces ‘ㄱ’ on a Korean keyboard; typing ‘o’ produces ‘人’ on a Traditional-Chinese (or Bopomofo) keyboard, etc. A radical composer composes a phonetic character from phonetic radicals given by these keyboards: e.g., typing 'ㄱ' (r) and 'ㅏ' (k) produces '가' on a Korean keyboard; typing ‘人’ (o), ‘弓’ (n), and ‘火’ (f) produces ‘你’ on a Traditional-Chinese keyboard, etc. Korean does not use ideographic characters so often. Because Chinese, Japanese, and Korean have many homonyms, each sequence of phonetic characters usually matches many ideographic characters: e.g., a Japanese phonetic character 'か' matches Japanese ideographic characters ‘化’, ‘科’, ‘課’, etc. ; Pinyin characters ‘ka’ matches Simplified-Chinese ideographic characters ‘卡', ‘喀’, ‘咯’, etc. ; Bopomofo characters ‘人弓’ matches Traditional-Chinese ideographic characters ‘乞’, ‘亿’, ‘亇’, etc. A converter often integrates an MRU (Most-Recently Used) list. Even though there are many ideographic characters for each phonetic character (or phonetic radical), a user does not usually use all these ideographic characters. A converter uses an MRU list to filter out ideographic characters not used so often from a candidate list. A converter sometimes integrates a grammar parser. A converter that integrates a grammar parser splits the given phonetic characters into grammatical clauses and converts only one clause at once. When a sequence of phonetic characters consists of n clauses and the i-th clause has m_i candidates, the total number of the candidates for the input characters become (m_1 * m_2 * … * m_n). To reduce the number of candidates owned by a converter, a converter usually processes one clause at once. This clause is called as a selected clause. For each element, a user agent can choose an IME for the element. To control the IME attached to an element, it is a good idea to add a method to the HTMLElement interface. If the getInputContext() method cannot be added to the HTMLElement interface, it should be moved to the InputMethodContext interface. Returns an InputMethodContext interface associated with this element. By default, a user agent returns an InputMethodContext interface representing the system IME. To change the behavior of the IME associated with an element, authors must first obtain an InputMethodContext interface by calling the getInputContext() method of the HTMLElement interface. This interface represents an ongoing IME composition. It provides an attribute representing the text being composed by an IME. It also provides a method to retrieve attributes of the specified character in the composition text. Represents the caret in this composition text. Returns the clauses in the composition text. Represents the text being composed by an IME. This string is equal to the text attribute of a compositionupdate event. This interface represents the caret in the composition text. When the value of its ”length” attribute is 0, an IME uses a vertical bar as an its cursor. Otherwise, an IME uses a block cursor as its cursor. When an IME does not show a caret, both values must be -1. Represents the length of the caret, in characters. The default value is -1. Represents the beginning of the caret, in characters. This value is less than the length of the composition text, or -1 if an IME does not show a caret. The default value is -1. This interface represents a clause of the composition text. This interface also represents attributes of the clause retrieved from a user agent so Web applications can render the clauses as a user agent does. Retrieving attributes is not supported by all operating systems or all IMEs. When a user agent cannot retrieve attributes from an operating system, it sets default values for them. Represents the background color used by a user agent to render this clause. This string must be parsed as a CSS color value. The default value is "transparent". Represents the color of an underline used by a user agent. If lineStyle is ”none”, this value is undefined. The default value is currentColor. Represents the style of an underline used by a user agent to render under this clause. This value must be one defined in the ‘text-underline-style’ of CSS 3; i.e., "none", "solid", "double", "dotted", "dashed", and "wave". The default value is "solid". Represents whether this clause is a selected clause. Represents the offset of this clause from the beginning of the composition text, in characters. Represents the text of this clause. Represents the text color used by a user agent to render this clause. This string must be parsed as a CSS color value. The default value is currentColor. Throughout this specification, the identifier CompositionClauseList is used to refer to the sequence<CompositionClause> type. Represents the detailed information of the ongoing IME composition. When an IME is not composing text, this value must be null. Represents the name of the IME associated with this context. Finishes the ongoing composition of the hosting user agent. When a Web application calls this function, a user agent sends a compositionend event and a textInput event as a user types an ‘Accept’ key as written in “Input Method Editors” section the DOM Level 3 Events specification [ DOM-LEVEL-3-EVENTS ]. Returns true when the hosting user agent is composing text. Returns the state of the IME associated with this context. Notifies the rectangle of composition text to a user agent. When a user agent renders a candidate window or a composition window, it uses this rectangle to prevent these windows from being rendered on this rectangle. On Windows, this rectangle is used as a parameter for ImmSetCandidateWindow(). On Mac, this rectangle is sent when it calls [firstRectForCharacterRange:]. On Linux (GTK), this rectangle is used as a parameter for gtk_im_context_set_cursor_location(). The x, y, w, and h parameters represent the local coordinates of a composition-text rectangle. A user agent may need to convert these coordinates to the screen coordinates when it shows a candidate window. Updates the composition information of the hosting user agent. The composition parameter represents the information of the new composition. Controls the state of the IME associated with this context. The enabled parameter represents whether a user agent activates this IME when the given node gains the input focus. When this value is true, a user agent activates an IME when this node gains the input focus and sends composition events to the given node even though the node is not an editable one, such as a <canvas> element. Provides a hint to the user agent so it can select the appropriate input mode of its associated IME. This function returns true when a user agent can change the input mode of its associated IME. Otherwise it returns false. The parameters for this function are copied from Annex E of the “XForms 1.0” specification [ XFORMS10 ], for consistency with that specification. The script parameter represents a Unicode script name. The modifier parameter represents a string added to the script name in order to more closely specify the kind of characters: e.g., "digits", "halfWidth", "kotei", etc. Controls the state of the IME currently associated with the hosting user agent. This function returns true if a user agent can activate or deactivate its associated IME. The open parameter represents whether a user agent enables the IME and disables it. Interfaces for developing Web applications that are aware of IMEs (IME-aware Web applications).